Monks and police scuffled on Monday at a Buddhist temple in Thailand where security forces are trying to arrest an influential former abbot on money-laundering charges. The standoff at the scandal-hit Dhammakaya Temple represents one of the biggest challenges to the authority of Thailand’s junta since it took power in 2014. 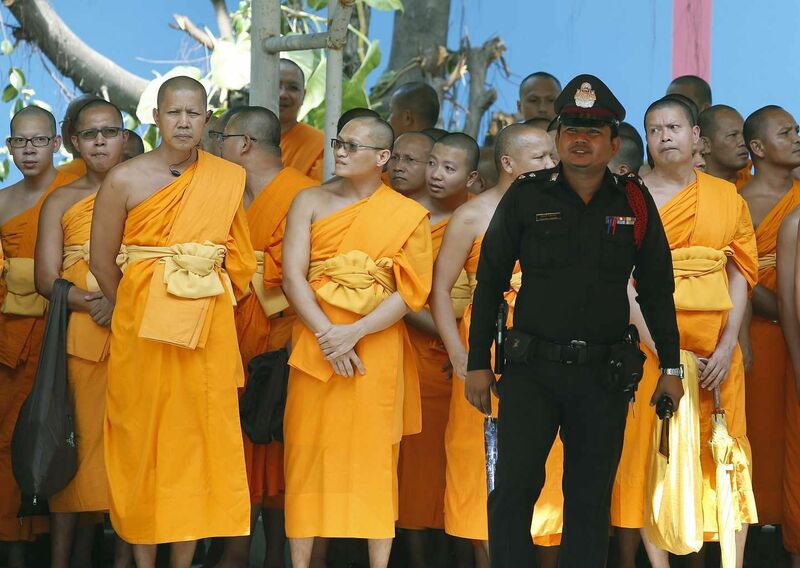 Police said they would try to avoid violence while threatening arrest for followers of the sprawling temple who have defied orders to leave and instead flocked there, hampering the search for 72-year-old Phra Dhammachayo. With tension rising four days after the military government ordered emergency powers to be used in the search, monks and police pushed and shoved at one of the temple gates. A Reuters photographer said there were no serious injuries. The widespread belief that the temple has links to the populist government ousted by the army in 2014, and a brasher brand of Buddhism than the conservative traditions of king and army, make the temple a thorn in the side of the establishment. The temple claims millions of followers and, in a country that is 95 percent Buddhist, assaults on saffron-robed monks are taboo. “We are going to do all we can to avoid physical and violent confrontations. The searches will continue and we will ask for cooperation from the temple,” said Suriya Singhakamol, deputy director general of the Department of Special Investigations. “Worshippers coming into the temple from the surrounding areas should turn back. We are asking for people to not come in as they would be breaking the law and facing arrest,” he said. Most police taking part in the search at the temple, on the outskirts of Bangkok, are not armed. Thailand’s largest temple, it covers some 1,000 acres (400 hectares). The government used what critics call “the dictator’s law” on Thursday to let police search the Dhammakaya Temple after months of failing to get it to hand over Phra Dhammachayo. He faces charges of conspiracy to launder money and receive stolen goods, as well as taking over land unlawfully to build meditation centers. His aides dismiss the accusations as politically motivated.